The actress who would become a royal. In a few months from now, Prince Harry and actress Meghan Markle will tie the knot, in an affair that seems more like a beautiful fairytale than anything else. Harry and his American bride-to-be Meghan will get married in May after officially getting engaged last week. The US actress with a disarming smile, will be leaving plenty behind. She will be leaving the hit TV show Suits for which she is most popular for. For seven years Markle has been a cast on the romantic legal drama. But now she will let it all go as she goes on to become the first American atress to wed a British Royal. She is to become a UK citizen, but will still retain US citizenship. But the good news is that she shouldn't worry about fitting into her new country. The beautiful star is far more British than she even realizes. Yes you read right, She is actually distantly related to both legendary Former UK Prime Minister Winston Churchill and one of the greatest writers of all time—William Shakespeare. These findings were revealed by genealogists Experts from MyHeritage, a site that specializes in tracing people's roots. After the royal engagement was announced the site did some solid research and found that the former Suits star is linked to the two well-known British historical figures. With such a heritage, that certainly makes Meghan a bona fide British lady! According to research findings, The 36 year old actress, who was born in Los Angeles, California is William Shakespeare's fifth cousin 13 times removed. The actress and the famous wartime prime minister Sir Winston Churchill are sixth cousin five times removed. They are connected through Zachariah Howe, who hails from a family of British settlers that originated from Essex. A MyHeritage spokesman, said: "When we heard the wonderful news about Harry and Meghan's engagement, we wanted to help Meghan discover some English roots of her own. "I'm sure she will be delighted to know that she comes from such prestigious British stock." Megan who sees her present situation more like a delightful change, rather than leaving her life behind, will certainly be ending her Suits run. Infact the production companies behind the popular legal TV series have officially announced that Meghan has wrapped up her role. 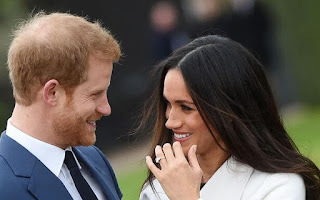 The actress herself has revealed she was leaving her acting career behind to start a new life with her Prince Harry following their engagement. Meghan who played the adorable Rachel Zane on the cable network legal drama, had risen up the ranks from an insecure paralegal to a lawyer. Currently, the character is engaged to be married to fellow lawyer Mike Ross, played by actor Patrick J. Adams. (Sorry Patrick). Suits officials have confirmed that Markle has already completed filming for this season, after shooting all her roles. But she will return on set in early 2018 for final filming before finally saying goodbye to her character forever. Another thing that Megan will be leaving behind is her beloved recue dog Bogart, a Labrador—Shepard cross breed who she is very close to. Initially it was thought that the dog will follow her to her new life. But it's now been reported that Bogart is too old to make the flight and adapt to the dramatic change. It's a huge change for her, but one she is both willing and happy to make. The wedding will take place in the spring, at Dr George's Chapel in Windsor, and the couple are responsible for the planning, but the royals will pay for the church, the flowers, the music,the food and decorations. The obviously loved up couple met back in June on a blind date that turned quickly into a serious Romance. And this has resulted in an engagement that has got the world talking.